This is an environmentally friendly, high performance detergent. The active foam is exceptionally effective for several pollution from oil and dust. The foam action of the product means that it is very economical for use. Contains no hydrocarbons (petroleum) as active ingredients. This silicone-based formula keeps seals flexible and repels water, preventing rubber seals from freezing in winter. Also provides UV protection and keeps rubber seals from drying out, which can lead to leaks and wind noise. The convenient foam pad applicator allows precise application. Extra Strong version of our classic Glass Cleaner. Scientifically formulated to remove the toughest stains and hard water spots from glass, this easy to apply cleaner produces a smear free clarity on windows, mirror and frames. The spray on cleaner even removes stubborn stains that appear only when wet and tough waxes or silicones from car wash machines. This highly concentrated; pH neutral cleaner was designed specifically for vehicle windscreens and headlight washers. It completely eliminates grime, grease, and oil, leaving behind crystal-clear visibility and a pleasant peach fragrance. Perfect for modern synthetic, polycarbonate, headlights. This cleaner provides an effortless, yet thorough removal of grime, such as insect residue, oil, tar, etc. Safe and effective for use on paintwork, glass and plastic. #200 AUTOSOL Eco Line Car Shampoo is a highly concentrated cleaner with maximum cleaning power. It is an ecologically sound product with reduced packaging. The cost savings dispenser ensures the correct dosage of one capful is dispensed. 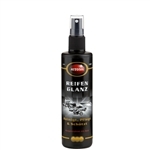 This cleaner provides an effortless, yet thorough removal of grime, such as insect residue, oil, tar etc. Safe and effective for use on paintwork, glass and plastic. Revives tires to create a brilliant shine that will look as good as new. Protects tires from becoming dry and brittle, using water resistant polymers, combined with anti-ozone technology (UV inhibitors) to deliver a formula that will last for weeks. Through rains and washings, Autosol tire shine lasts longer and keeps your tires looking their best. Autosol Polish for Anodized Aluminum is a specially formulated polish containing the finest of polishing substances to achieve optimum cleaning results on all types of anodized aluminum without harming the anodized surface. Autosol M1 cleansing polish is a specially formulated polish containing the finest of polishing substances to achieve optimum cleaning results on all types of chrome-plated synthetic materials without harming the chrome plating. M1 cleansing polish contains special aluminum-oxide with a minimum of abrasion, but a maximum polishing effect. Cleans and protects in one step.